Screengrab via British Newspaper Archive. A horse which suddenly became crazy and dashed into a house in Albany, Illinois, a few nights ago, seems, says an American paper, to have made a decided sensation in that quiet village. A correspondent says as he was being led through the streets by his owner, Mr Backwith, he began to whirl round, and then, freeing himself, he rushed through a strong gate into the garden of Mr. Pease. Passing rapidly along he succeeded in going through three more fences, dually [sic] emerging into the opposite street. Crossing this avenue, in a direct line he went through Dr. Robinson’s dooryard fence and into the house by the front door. Mrs. Robinson was seated in the parlour, and upon perceiving her strange guest immediately fled through the rear of the building. In her momentary fright she forgot her young babe. Dr. Robinson, hearing the crash, rushed into the house just in time to save his child. Indeed not a moment too soon, for the beast had already demolished part of the crib, besides leaving a flesh wound upon the child’s face. Sewing machine, sofa, chairs, and stove soon followed, and the carpet was literally cut in pieces. Having completed his course here he turned into a bedroom, and, getting his fore feet upon the bed, soon brought it to the floor. Men rapidly collected, and ropes were thrown around his body, but they could not force him to subjection until he was severely bled. Then thirty or more men forced him home, and having tied him down they managed to keep him in the stable. He did not return to consciousness, and died about midnight the same night. The animal was valued at 3,000 dols. ; and was sent from New York not long since. Screengrab via British Newspaper Archives. One of the most singular funerals took place a few days ago at Maryland. 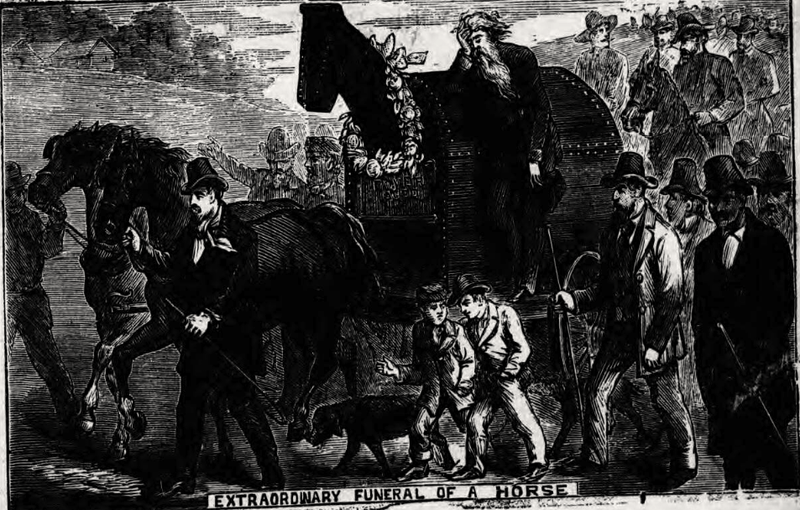 A wealthy merchant at his death, in addition to many munificent bequests and legacies, left a certain sum for the maintenance of his favourite horse – a fine old hunter – and at the death of his favourite the horse was to be buried with all the formality and pomp bestowed upon a Christian. A coffin was made of a peculiar construction, and in this the body of the dead horse was placed. The coffin was placed in a hearse, in which it was conveyed to its last resting-place, accompanied by bearers, mourners, porters, and a heterogeneous throng of followers. 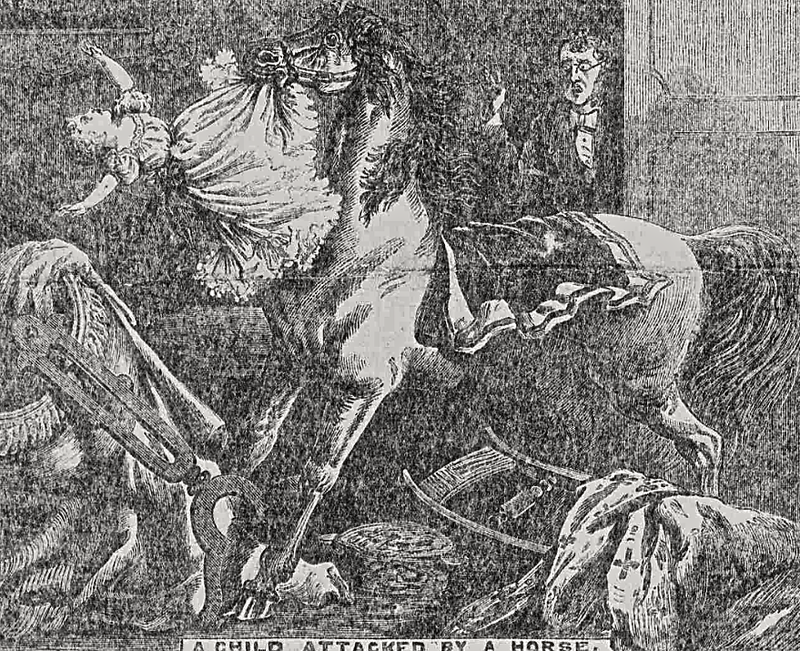 Illustrated Police News, Saturday 24 March 1877, via British Newspapers Archive. Screengrab via British Newspapers Archive. A scene occurred on Saturday last at Wragby, which we shall find it difficult to describe by mere words; we must, therefore, refer our readers to the front page of this week’s POLICE NEWS. The large engraving gives a faithful representation of the consternation caused by an unlooked-for visitor to a family tea-party. The particulars of this remarkable and singular feak of an animal of the genus equine as follows. It appears that the driver of the mail cart between Horncastle and Langworth, Lincolnshire, was performing his usual journey on Saturday last; the horse he was driving had always been accounted a steady going, docile animal, being, as horsedealers say, “warranted free from vice.” After proceeding along for some considerable distance without any mishap, one of the traxxes broke and the mail cart-horse all of a sudden dashed off at a furious rate. He, luckily for the driver, disengaged himseld fromt he cart after which, like Mazeppa’s wild steed, he “urged on his mad career.” He did not meet with any vehicle ont he road, and consequently no fatal or serious accident occurred. At length upon reaching Wragby the animal bolted through the window of a house occupied by Mr. Weightman, and landed on a tea-table were [sic] ten persons were just taking tea. 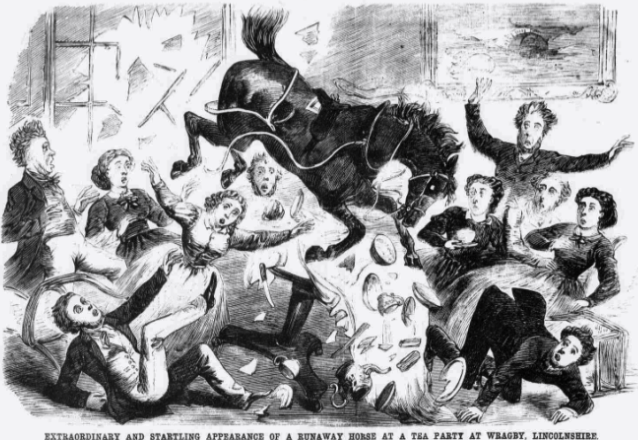 The panic-struck family and guests started back, but strange to say no one was hurt, but the crockey and furniture sustained serious damage from the hoofs of the eccentric quadruped, who was not secured until he had broken no end of crockery, and smashed up the furniture. At length the uninvited guest suffered himself to be conducted out of the house. Illustrated Police News, Saturday 23 March 1867, via The British Newspaper Archive. Jesse Owens faces his speediest opponent: a racehorse.